There is no doubt that having an “Insta-worthy” dorm room can be a pricey thing to achieve. However, why overspend on décor when the same product, or perhaps something even better, can be recreated for less money? Not only does this route entail less spending, but it is also a fun and creative way to personalize a room to make it feel like home. With spring approaching, a flower-wall can be just the thing to give an ordinary dorm room the extra seasonal and personalized touch it needs. 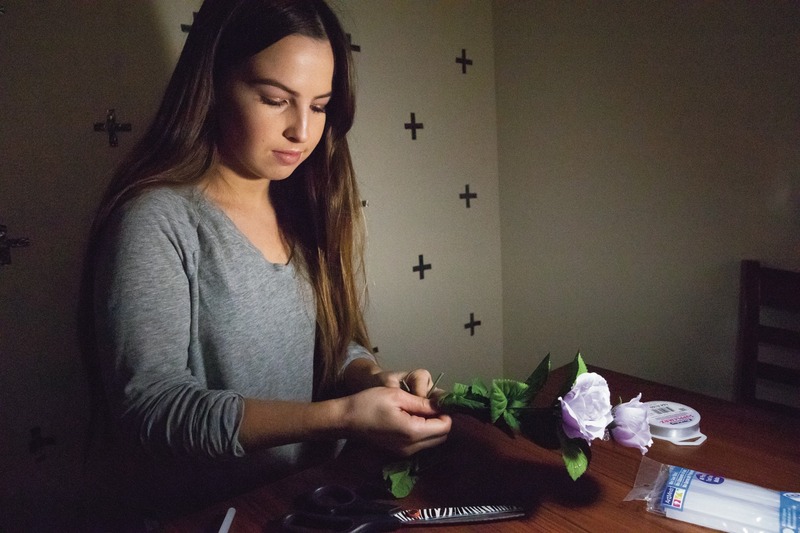 Five small bouquets of flowers, scissors or wire cutters, clear fishing line or jewelry-bead cording, clear push pins and a glue gun are all that is needed to create the perfect personalized flower-wall. Apart from the glue gun, all of these supplies can be conveniently found at a local dollar store. Many Pinterest boards recommend that each bouquet of flowers should be a different color and type from the rest. However, the important thing is to make sure all the stems are the same shade of green; otherwise, the flower strands will look inconsistent. With all supplies included, this DIY project should not cost more than $11 and take no more than an hour and a half to complete. • Step One: Take one bouquet of ow- ers and cut each ower at the base of the stem to separate them into single owers. If the owers have long stems, cut them to desired length, but make sure to keep the leaves in tack. • Step Two: Lay the owers down and separate into six vertical lines with ve owers per strand. Plan how you would like them to be assembled on the wall. Try to make sure every strand assortment looks di erent from the rest so the wall ap- pears cohesive. • Step Three: Starting from the top of one strand, use the glue gun to place a small amount of glue at the bottom of the rst ower and insert it into the middle of the ower you want to hang below it. Con- tinue this step until the desired length for that strand has been reached. • Step Four: Once the glue is completely dry, take the clear fishing line, cut a small amount off and tie it around the head of the first flower. Then, tie another knot about an inch above the flower so it can hang on a push pin easily. 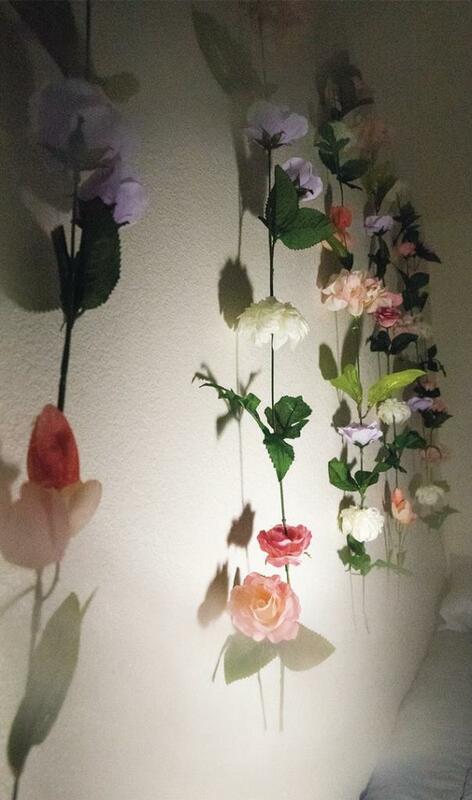 • Step Five: Hang each flower strand side-by-side on the wall. The clear fishing line and push pins should make the flowers look as if they are floating. If the strands end up being di erent lengths after being placed on the wall, cut them to t and match accordingly. Not only is this DIY easy and cheap to create, but it can be customized to t one’s personal preference, with di erent colors and types of owers, lengths and position on the wall. This flower-wall is just one simple, cute and inexpensive way to give any dorm room that Insta-worthy touch. It will surely have friends asking where they can buy one just like it. 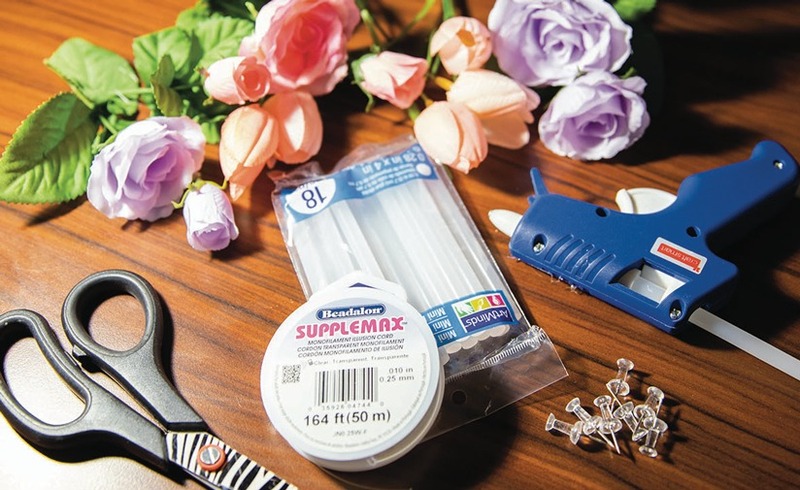 The bright and colorful flowers are sure to bring about the spring spirit, so get a glue gun and get going. Now is the time to DIY and save money doing it.